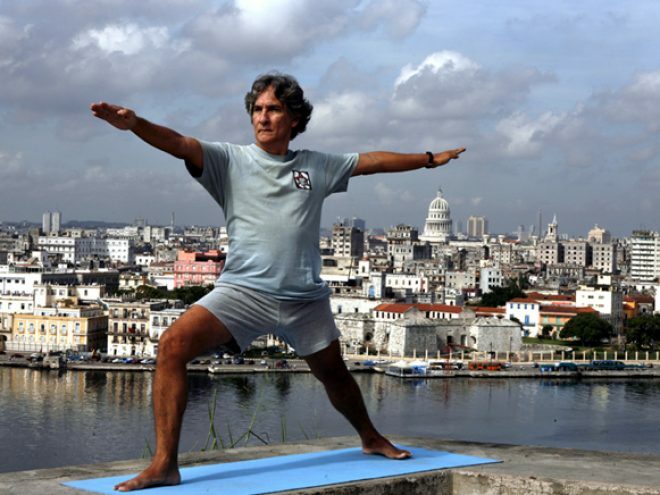 In Cuba—and Havana in particular—Eduardo Pimentel V?zquez is yoga personified. Known throughout the island for his national yoga television program, Eduardo has managed to convince many Cubans that the practice of this age-old discipline, which dates back to second-century BC India, may be a channel for the self-knowledge and mind-body harmony that humans have long pursued in the name of faith, philosophy or science. Aside from the fact that yoga, as everyone knows, improves one?s health. Yoga is a coherent system where every technical element is designed in such a way that a person has a responsible meeting of mind and body. It was structured around the 2nd century BC—although it could be over three thousand years old—for the betterment of humans, to enable them to coherently handle unity of mind and body. Its origins can be traced back to the translation from Sanskrit into Latin, and then into Spanish, of a number of books from India, including several chapters from the Bhagavad-Gita, the famous Sanskrit epic poem translated by Francisco Mateo de Acosta y Zenea in Havana, 1841, and Matanzas in 1898, long before it came out in Spain. I believe the translations is a praiseworthy work, which is why the library in my studio, which specializes in yoga, Buddhism, theosophy, and other related topics, is named after this practically unknown Cuban intellectual. In 1899-1900, a Mrs. McKinley founded the Raja Yoga Academy in Santiago de Cuba, where, despite its name, no yoga was ever practiced. It was a kind of fraternity involved in charitable work. A year or two later, theosophical thought made its debut in Cuba. Works on yoga by Annie Besant, one of the world leaders of theosophy, circulated on the island together with other works on the philosophy and the practice of yoga. By the 1950s, Hatha yoga was being practiced and the followers of Swami Paramahansa Yogananda—whose Autobiography of a Yogi was well-known in the Western Hemisphere—founded the devotional Asociaci?n de Autorrealizaci?n (Self-Realization Association) in 1957, which is still active. From 1975 until his death in 1985, Freemason Ram?n Aristes Guinea taught large classes of Hatha yoga in the Llans? Masonic Home. I began teaching techniques of Hatha and Raya yoga during the 1980s. I used to play chess and at the same time enjoyed physical activity, so when I found out about Swami Sivananda?s Hatha Yoga I became very excited because I had found exercise and meditation—the physical and mental aspect—along with the possibility of an understanding of life itself. I began training in 1971 and teaching since 1982 based on B.K.S. Iyengar?s method, although trying to cultivate a Cuban style where the student-teacher relationship is more flexible, closer and warmer. From 1990 to 1994, I taught large public classes of more than 200 students at Sagrado Coraz?n Church on Reina Street. These classes later branched out to the Teatro Nacional, the Mella Theatre, the Museo de Artes Decorativas, the Pasionistas Church, art galleries, social clubs, health facilities, and, with more specific goals, to the National Art Institute, the Cuban National Choir, and Havana?s Science Park. The Cuban Yoga Association, a member of the Latin American Yoga Union, was founded in 1990. The association is neither religious nor philosophical and is dedicated to teaching yoga to the community. It has some 25 instructors (five of them professors) with local branches in eight of the island?s provinces. There are programs for fighting stress and asthma that are registered with the National Institute of Sports and Recreation (INDER), and classes aimed at older adults and women. My wife, Professor Elsa Hermida, has undertaken a project in the Paediatric Ward of the Havana Oncology Hospital that includes recreational activities for children who are able to take part, as well as for the mothers accompanying their children. I estimate that some 12,000 people in Cuba have taken three-month yoga courses. The Association has also organized the First Therapeutic Yoga Workshop, the First International Therapeutic Yoga Conference within the Havana BIONAT 2006 convention on health and natural medicine, and numerous workshops and meditation retreats. In addition to people whose occupations lead them to choose yoga—such as dancers, musicians or scuba divers attracted by the benefits that concentration, relaxation or proper respiratory regulation may bring to them —we asked Professor Pimentel what other motivations there may be to explain the increasingly popular interest in yoga on the island. People who suffer from obesity, different types of addictions, osteo-muscular pains, asthma, stress, insomnia, sexual dysfunctions, psychological conflicts (divorce, the loss of a loved one, communication issues with offspring), come to us and we help—through their own selves and potential—to find relief for many of their sufferings. Others, who also become interested in yoga, although to a lesser degree, are individuals who wish to change their lifestyle. Through yoga both groups increase their self-esteem, live in harmony with themselves, and understand the ?other person?s? position, beyond intolerance or fundamentalism of any kind. Basic, intermediate and advanced courses. Private classes. Yoga for women. Practices include postures (asana), breathing techniques, relaxation, meditation, intensive training, special workshops, and lectures.